During CNY many Chinese will have a box of candied fruits and nuts at home to welcome friends and families when they visit and also given them as gifts. Popular candied stuff like candied lotus root slices, lotus seeds, red dates (jujube), kumquats and winter melon. 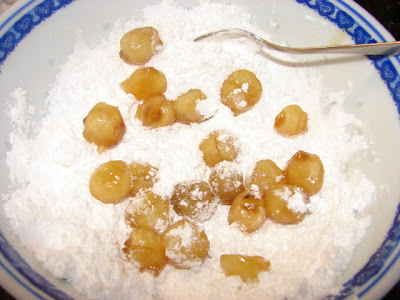 Candied lotus seeds (tang lan zi 糖蓮子) are popular especially for any family wishing to have kids because the word lotus seeds in Chinese rhyme with having more children. 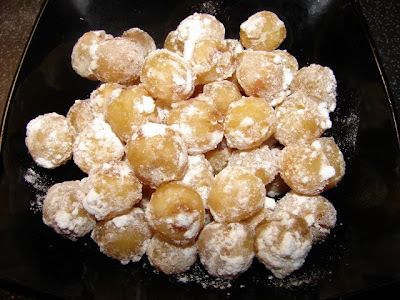 Candied lotus seeds are quite yummy if you don't count the sugar. It's not that difficult to make. If you want to try here is the recipe. 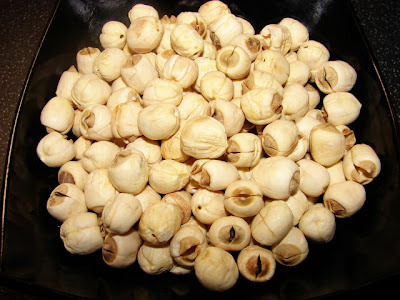 Soak the lotus seeds for at least 10 hours or till the seeds are plump without any wrinkles. Then take each seed and lightly squeeze the brown end to check if there is any greenish/brownish stem inside the seed in the centre, if there is you have to remove it because it is very bitter. Use a sharp small knife and scrape the bitter stem out, careful not to break the seed into 2 halves, best to keep the seed whole. If you are lucky you may find about 10 in a packet, sometime there could be more, so be warned this can be time consuming and boring. It's worth it once you have done that. Rinse the seeds and put them in a small saucepan with enough water to cover them and a bit more. Add in 1/2 tsp of bicarb. Bicarb helps the seeds to soften more quickly. Let the water boil then turn it down to low and simmer for about 15 - 25 minutes. Do check regularly the water can boil over easily. Check the seeds for doneness around 15 minutes onwards and every 5 minutes later if required. Check the seeds are just tender yet still very firm without the skin starting to break, once tender turn the heat off. This is important you do not want the seeds to overcook, or it will turn into mush during boiling or at the later stage when boiling with sugar. 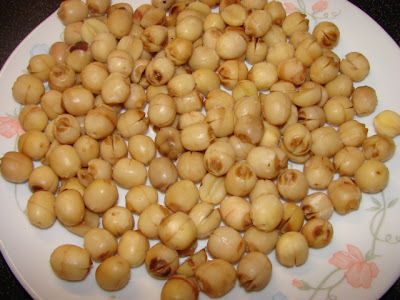 Drain the cooked seeds and spread them out on a tray or plate to air dry for 2 hours or overnight. The longer the better. Put the sugar in a small saucepan with 5 tbsp of water. Let this boil at medium heat till sugar has completely dissolved when you get a clear syrup. You can swirl the pan about to move the sugar. Continue boiling till the sugar bubbling up rapidly and when it started to turn yellowish. Pour in the lotus seeds all at once without stirring. Continue cooking at medium heat. You will see a lot of liquid drawn from the seeds. Then stir gently without breaking the seeds or just move the pan about. Let the syrup reduce to about 1/2 or when the syrup looks thick and glossy but still runny. Do not let the syrup dry up too much or the seeds will stick together, also cooking the syrup for too long can overcook the seeds and make them really soft and turn into mush. Use a slotted spoon remove the seeds, shake off excess syrup, and pop the seeds onto a bed of sieved icing sugar. Let the seeds generously coated with icing sugar and put on a plate or tray in single layer, sieve a bit more icing sugar on top of seeds, let them air dry for 1 day or more till the coating looks no longer wet. Quicker to dry in a warm place or a warm airing cupboard. Then they are ready. For gifts pack them with pretty gift bags, preferably reddish or pinkish, red is lucky colour for CNY.